Massachusetts Real Estate News: Thanksgiving Trivia Do You Know The Answers??? Good morning and happy Thanksgiving day. Most are off to Thanksgiving day football games or off to the relatives to have a terrific dinner. I am writing a post this morning to say true to the 30 blogging challenge that I agree to. So far, so good. I think that a fun post is in order this morning, so what about some fun facts that we can take to the Thanksgiving day table? Thanksgiving is probably my favorite holiday. I love thinking and reading about the beginnings of this nation and how we did, and then didn't, get along with the native folks. Today is for fun, so how about a little Thanksgiving related trivia? Being from Massachusetts, we think we have learned it all. But have we??? 1. What is credited as the Pilgrims first landing place and where is the rock? 2. What was the name of the ship the Pilgrims came over on? 4. In 1621, How long did the First Thanksgiving last? 5. What was the name of the Indian Chief that had dinner with the Pilgrims? 6. What's another name for the "horn of plenty"? 7. Can you eat "indian corn"? 8. 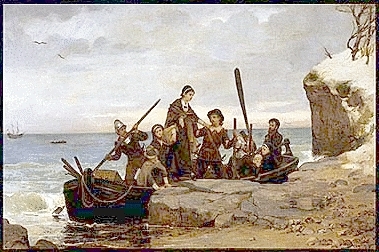 How many days did it take the pilgrims to get from England to Plymouth? 9. Can turkeys drown if they look up in the rain? Want more Thanksgiving Trivia? Visit this web site.